As much as I love historical fiction, there is something I enjoy even more. A well-written biography. Or, in the case of Beautiful on the Mountain by Jeannie Light, an autobiography. If you enjoyed the classic novel Christy and the bestselling Mitford series, then you’ll love Beautiful on the Mountain, a real-life tale about serving God in unlikely circumstances. In 1977, Jeannie Light left her fine plantation home amid heartbreak and came to Graves Mill, a tiny hamlet in the Blue Ridge Mountains. Alone in an utterly new kind of life, Jeannie was determined to find the courage to make a fresh start. To Jeannie’s surprise, she found herself called upon by her new neighbors to open the old, deteriorated country church, a place that had once united the fractured community of mountain folk. With no training, and no small amount of trepidation, she undertook the task. And as she embarked on an unforeseen series of adventures, from heartbreaking to hilarious, Jeannie would learn more than she ever expected about faith, loving your neighbor, and doing the work that God sets in front of you. Because sometimes, God calls us to go where there is no path . . . and leave a trail. The description grabbed me immediately. 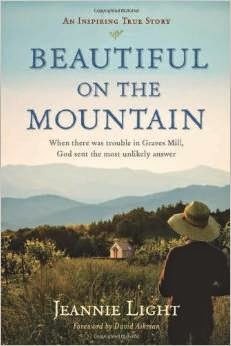 I did really enjoy the novel Christy, and I've always been fascinated by the Blue Ridge Mountains. Plus, the cover is simply gorgeous. Once I got the book, however, I started second-guessing myself. The first few chapters tell a bit about how Jeannie came to be living in Graves Mill, and while definitely a necessary part of her story, it did take awhile before I could start to really care. What struck me about this story, which mostly takes place from about 1977-1979, was the struggle to have a community in this rural area. The Graves Mill Church was once the center of things, a place where people could come together and love God and each other. But it has been closed for quite some time, and Jeannie is called on to get it back going. The story that unfolds is filled with amazing 'coincidences' and fascinating twists along the way. Like so many rural churches, the odds are against them. Organized religion tends to be as well, as the late 70s were roughly the start of the move towards mega-churches. Jeannie runs up against the "let 'em drive into town" attitude that I've seen in my life too. The world needs rural churches though. Really. That described Graves Chapel's history, of course. It was closed because it could no longer pay its way, and without pastoral care, the people scattered. But there was a problem with the theory. Some of the local people didn't fit in the town churches and wanted a community. They remembered the days when people stayed on their home places, when families joined together to plant and harvest, when cider making was a festival time. A big church may have small home groups or house churches as part of their structure, but they are not like the original interdependent community. They are not attached to the soil and trees and rivers. They do not fill that longing to belong somewhere, to some people, to some place where everyone knows your name and even your father's name. This was the chapter where I started to see the folks in Graves Mill as my neighbors, and where I started rooting for the church to not only open, but to thrive. You see, I'm part of a church that goes back a hundred years plus, to the original homesteaders out here. A small church, serving a widely scattered population in ranch country. We're pastor-less at the moment. But one way or another, we are going to survive and thrive. Because driving into town isn't an option for many of us either. I know most of my readers are not rural, but I think there is still the appeal of rooting for the underdog here. I'm glad to have read this book. And as of right now, it is free for Kindle.